ANNOUNCER: GrowingDeer.tv is brought to you by Bass Pro Shops. Also by Reconyx, Trophy Rock, Gallagher, Muddy Outdoors, Eagle Seed, Nikon, Barnes, Redneck Hunting Blinds, Derby City Turkey Calls, Ansmann, and Antler Dirt. GRANT: Mid-March, here at The Proving Grounds, and it’s still cold. Gosh, thirty something this morning, spitting snow last night, but it’s time for me to be thinking about growing new antlers this year and the tools I need to do that. 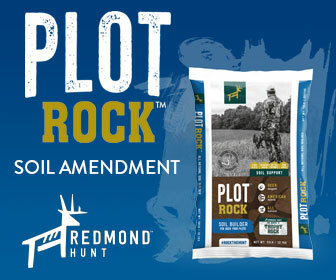 And people think – when I say tools – food plots, and guns, and bows. But one of the most important tools is what Jeff has in his hand. What do you have, Jeff? JEFF: That’s actually a soil probe. GRANT: Soil probe. And we’re talking about soil samples, of course. Jeff is with Waters, like flowing water, Waters Ag. And Jeff, basically, what happens is people like me, all around America, collect a little boxes of soil, send ‘em to you, and you tell ‘em, basically, two things – what’s in their soil and what they need to add to grow crops to a certain productivity level. JEFF: That’s exactly right, Grant. GRANT: And – and I want to grow crops – not because of a combine, I can’t even get a combine here at The Proving Grounds, it’s so steep – but good crops mean bigger antlers. And the bottom line is if I’m worried about what’s on top of the head, I’ve gotta be worried about what’s below their feet, what’s in the dirt. Because if it’s not in the dirt, plants can’t transfer it. You’ve heard me say plants are just nutrient transfer agents, so I need good nutrients in the dirt, for plants to transfer to the deer. The deer transfers to the antler, which I, then, transfer to my wall. So in this whole transfer process, one of the most important steps is a soil sample and you see tens of thousands of samples a year. JEFF: That is correct. That is…. GRANT: Some not so good. JEFF: Some not so good is exactly right. GRANT: So, today, we want to talk about how to collect – properly collect – a soil sample and some variables with that and what that really means to produce big antlers. GRANT: Jeff, now, my normal tool is a bow or gun, but you’ve got some different tools today. I noticed you’ve got a shiny stainless steel tool and I’ve got an old rusty tool. Tell me the difference here. JEFF: Well, the tool of choice that I have is a soil probe. Uh, most people, I realize, won’t have a soil probe, so we can go to a shovel, or a spade. There are some downfalls. You’re gonna have some elevation and some iron and zinc levels, due to the fact you’ve got some rust. It’s a stainless steel versus mine is actually chrome. You’re not gonna have that contamination. GRANT: Same thing with the bucket. We want a clean plastic bucket. Don’t want that metal bucket, do we? JEFF: Put it, preferably, in a plastic bucket, just because we don’t want to put it, once again, in a metal bucket, ‘cause we can have some elevated levels of some different nutrients. GRANT: And not just a plastic bucket, as Jeff taught me, but a clean bucket. You don’t want your old detergent bucket, or something you bought, you know at Sam’s with a bunch of detergent in there, ‘cause that’s gonna give you a really elevated level of something that might not really be in the dirt. So clean is the word, when you’re collecting your samples. You want it clean, so you can get a true ra – reading of what’s in the dirt. GRANT: All right. Let’s collect a sample and see how this goes. JEFF: All right. When we’re taking samples, I don’t like to get real close to a tree line. JEFF: Just because of the root uptake of those trees and everything. We want a representative sample of – of the crop that we’re gonna be growing in the field. GRANT: So, I see one big advantage of using your core sampler here versus my shovel is that you’re getting just the right amount where a shovel, you might fill this whole bucket and you don’t know if you’re really stirring it up, or getting a good cross sample of the whole field. JEFF: That’s exactly right, Grant. In, in, in high moisture situations, such as this, it’s gonna be hard to get a good mixture of that soil. GRANT: Okay. Well, we’ll finish up and then we’ll talk about what to do after we finish collecting our sample. GRANT: So, an important take home is we want to make an X pattern or something, where we’re not just in one area, where historically a buffalo died, or something, and the nutrients are all different there. We want a representative sample of the whole field. GRANT: Okay. So we’ve collected our soil sample. But that’s still not doing a guy like me any good. I can’t lick it, or look at it and tell how much N, P, and K’s in there, so I need to get it to you. What’s the simple process to do that? JEFF: Well, label the bag that you’re gonna be sending it in. You can send it in one of our soil sample bags, in a paper bag – lunch bag, uh, Ziploc bag – however you got the means to do it. Put your name and a sample ID on the bag, and then, place the sample, of course, in the bag. GRANT: First, number one thing, is we’ve got to have our bag labeled with the field number. GRANT: And then, our name, of course. But I think one of, the third thing, that I see clients not doing all the time is not telling the lab what they want. What do they want to plant, and how much of that they want to grow? What’s their potential? So, what we’re saying is there’s a big difference in the recommendation – let’s say between soybeans and corn. Why is that, Jeff? JEFF: Uh, absolutely huge difference – not only just between crops, but as far as the yield go that you’re going for. I mean, that is how you’re gonna know exactly how much fer- fertilize, compost, manure, whatever you’re using for your fertilization needs. That is how you’re gonna know exactly how much to put. GRANT: So, in simple terms – like for guys like me – you can’t tell me how much fertilizer to put down, unless you know what crop I want to grow, because for example, soybeans, or clover, or legumes need a certain group of elements, or fertilizer, and corn, or grasses, need a different type of fertilizer. GRANT: And the more precise you can be, the better your recommendation can be. JEFF: That’s correct. And it will way less confusion on our customer’s part, at that point in time, as well. GRANT: Even more, even at a more advanced level than that, Jeff’s lab will give you recommendations based on the yield. So I want to grow the biggest antlers I can. GRANT: But here in the Ozarks, I mean, no one grows corn. So a realistic goal, for me, is about 175 bushels, where if I’m working up in Iowa – some of my clients in Iowa – we may try to go 300 bushels of corn per acre. 300 bushels is not realistic, where I live, so, if I told Jeff give me a recommendation for 300, he would recommend more fertilizer than my ground could really handle right here. So talk to your local farmers, whatever’s going on, and say, “My yield can be X, for soybeans, corn, tons of clover, whatever, and I’m gonna grow this crop. Clover with rye, or just clover.” And that way, you can give a really precise recommendation. JEFF: That’s exactly right, Grant, and even, we can also – if you decided that, uh, after sending a sample in, and you wanted it for corn, you decided you wanted to change to soybeans, just give us a call and we can make that change. GRANT: That’s service. That’s great. So remember, to grow antlers, it’s got to be in the dirt. The plants have to be able to take it out of the dirt, the deer ingest it, digest it, and you get antlers or fawns. That’s why it’s so important to do a soil test. I want to take a whole episode of GrowingDeer and talk about one of the most important things you can do, as a wildlife manager, and that’s do soil tests. JEFF: That’s exactly right. It’s easy, and most economical thing that you can do, in order to be successful. GRANT: Thanks for your time.